This week we have been practicing for our sports day and writing letters to Greenpeace about some animals that we have found in our gardens, ponds and even bathtubs! On Thursday we spent the morning taking part in the real sports day and we had lots of fun! The most popular race was the egg and spoon race! We also had a lovely ice-cream to celebrate. 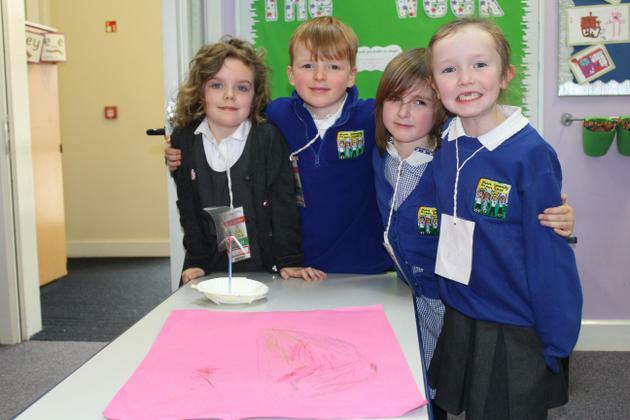 Next wee we are having a whole school History week. Elm class are excited to find out what we are learning about. 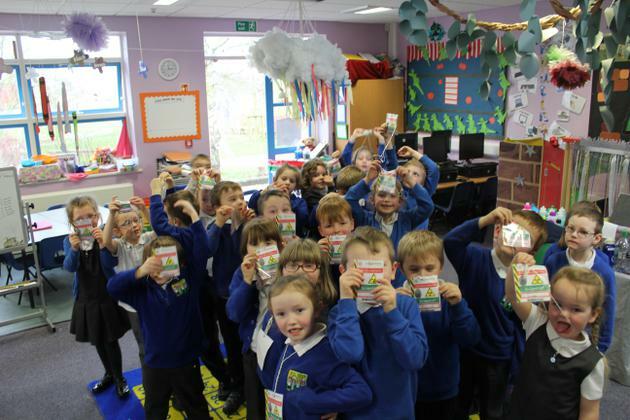 This week we went on our school trip to Thetford Forest. When we got to the woods we used identification guides to name some of the trees that were growing around us. We looked closely at colours, textures and patterns to help us. We found about 8 different types! 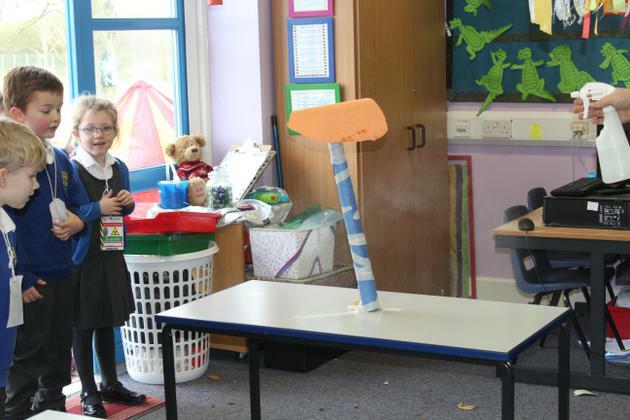 After that we were given a challenge to create a character using the items around us. we had to think of the problem the character could be facing ready for our writing next week. 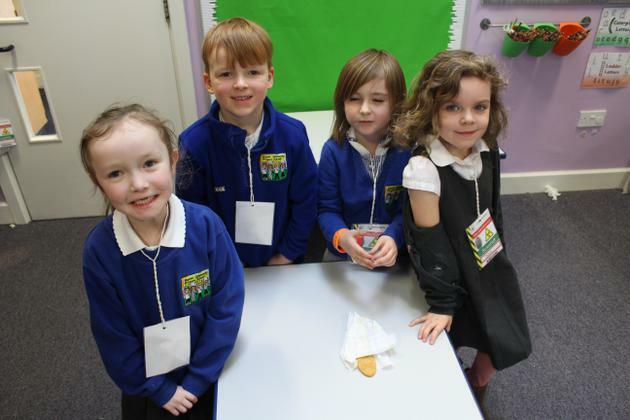 We then had a break for lunch and we got to sit down all together as a class and enjoy our lunches. After that we had some time climbing HUGE climbing frames and sliding down really high slides really quickly! We then followed the sound trail around the woods and we got to play on some pretty impressive instruments! 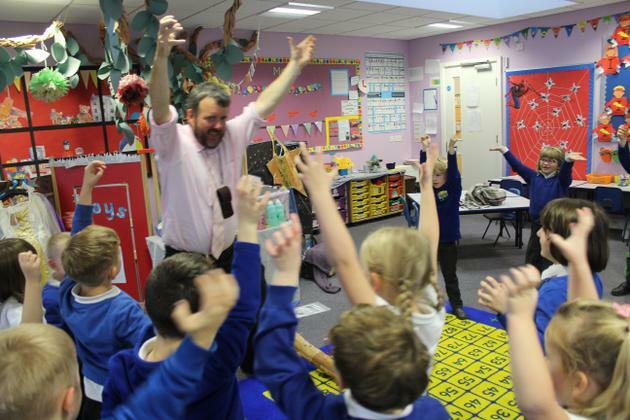 Mr Lenton especially enjoyed the jumping trumpets! We have spent the day discussing our favorite characters from all the stories that we love. Elm class had some pretty amazing costumes too! 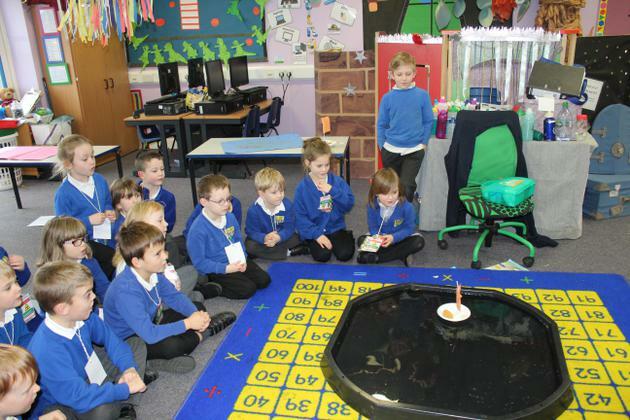 Previously in the week we looked at finding the difference between two numbers to calculate how much change we needed. We also began to explore Haiku poems. this morning we had our first fire session. We used our math skills to follow a recipe to create some damper dough. 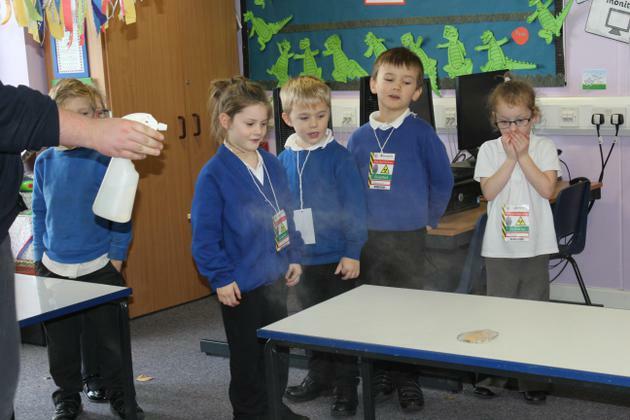 We then learnt about how to create a fire with Mr Lenton. 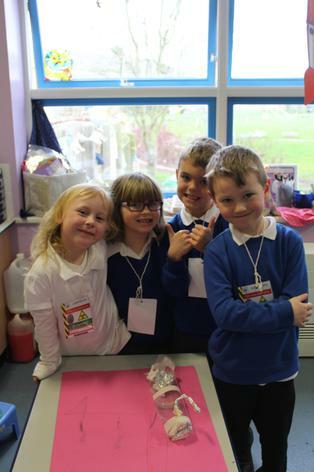 We then prepared our dough on our cooking sticks and cooked them over the hot embers! 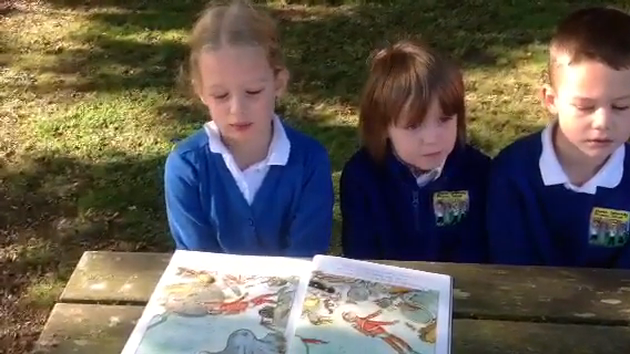 This week we have been using the story Handa's Surprise. 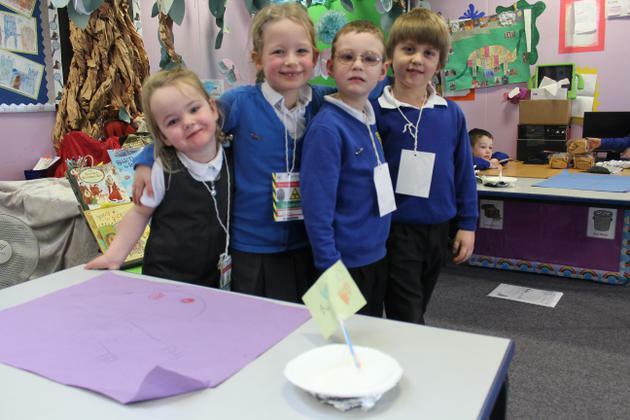 We are creating our own version of the story and we have named it 'Elm Class' Surprise". See below for a picture of one of our stories. Can you guess who they were surprising? 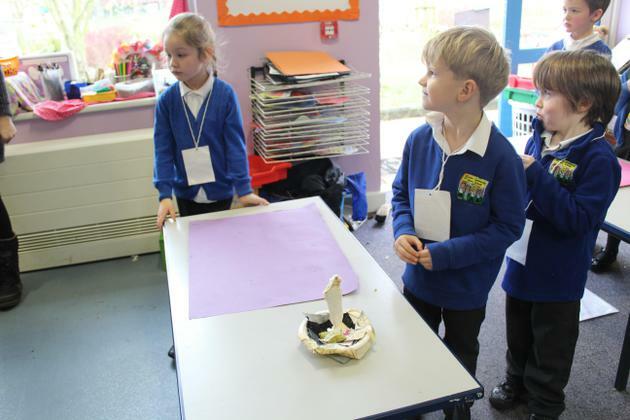 In the our foundation subjects we have been exploring Greek Myths and we have used this to create poems, music and dance. This week we have been looking at the world's oceans. We know that there are five of them but we are still learning to remember the names! We have used google earth to see what our planet looks like from space. We found out that the earth is mostly water. 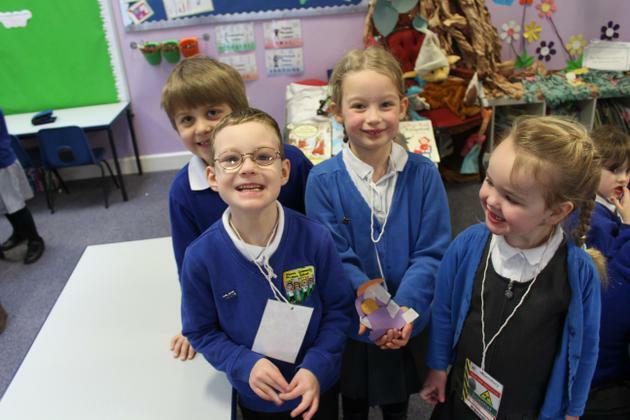 We labelled a picture of the United Kingdom and we learnt the different countries that are there. 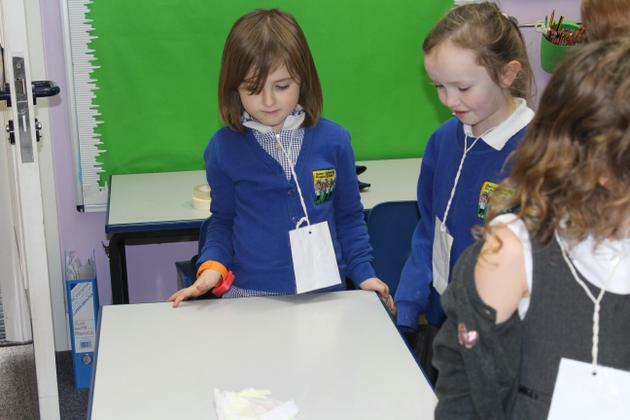 We then played a game with a passport where we had to locate the different oceans and continents of our planet. On Friday we looked at the artist J.M.W. Turner. 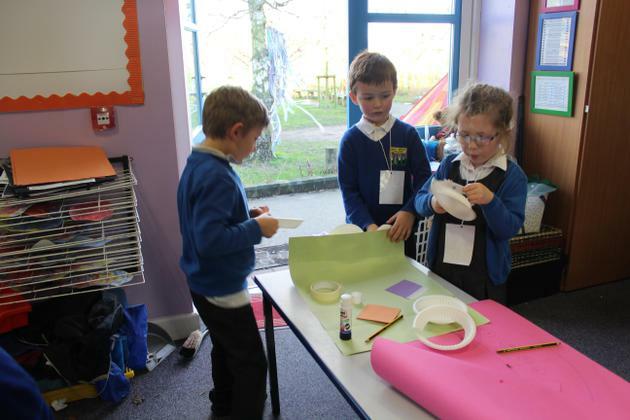 We found out that we was really good for painting pictures of stormy seas. 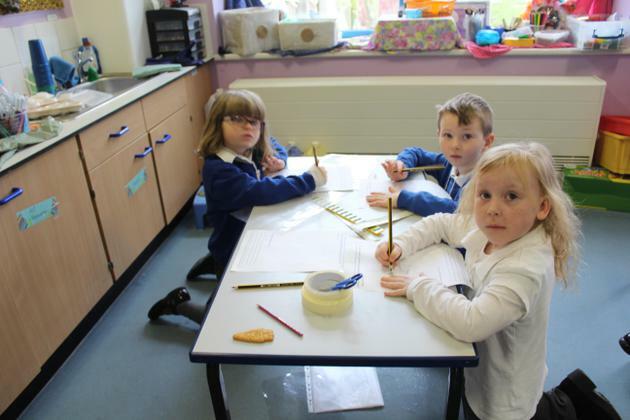 We then started to create our own stormy sea picture in the style of J.M.W. Turner. Have a look below to see what steps we have taken so far. 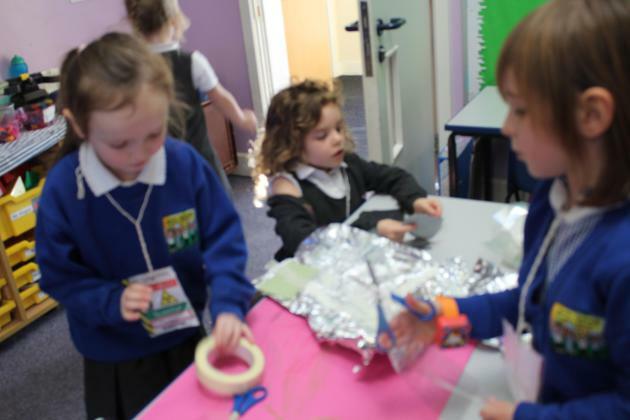 This week we continued our work on sculptures. This time we used the natural resource of mud to create faces in our outdoor area. Look at the pictures below to see what has been created so far. We also performed our class assembly of 'down the back of the chair'. I am very proud of the class' achievements this week and so should they! Please enjoy the story that we have written. Can you tell what we have changed? Not by the hair of my chinny chin chin. I will not let you in.” said the first little goat. So he huffed and he puffed and he blew the house down. The little goat ran and he ran and he ran to the house of plastic. The big bad troll knocked on the door of the plastic house. “Little goat, little goat, let me come in.” he said. “Not by the hair of my chinny chin chin, I will not let you in.” said the second little goat. So the big bad troll huffed and he puffed and he blew the house down. The little goats ran and they ran and they ran to the diamond house. 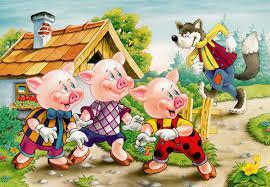 This week we have been planning our own version of the three little pigs. as a class we have decided that our story is going to contain 3 little goats and a big bad troll. We are also changing the materials that was used to build the house. Check back next week to see how our story turns out. 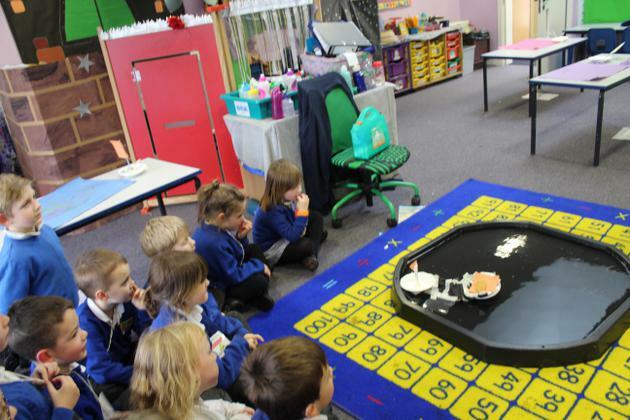 Today we came into our classroom to find that the gingerbread man needed our help to get away from the fox! he left us three very special questions. The first question was 'what will happen to me if I fall in water?'. 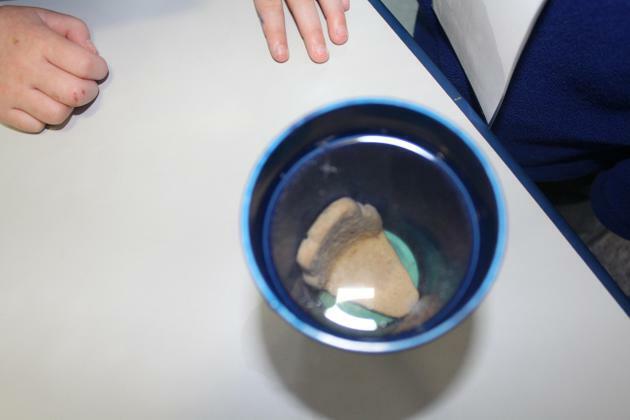 We decided to test this by dropping a gingerbread man into a cup of water for three minutes. We made predictions about what would happen. 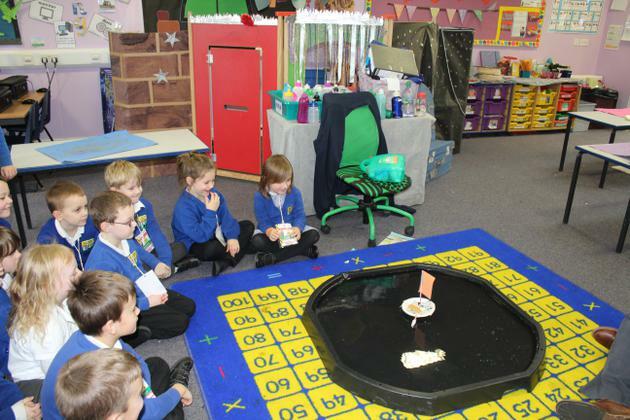 We found out that the gingerbread man would turn soggy if he were to fall into the river. 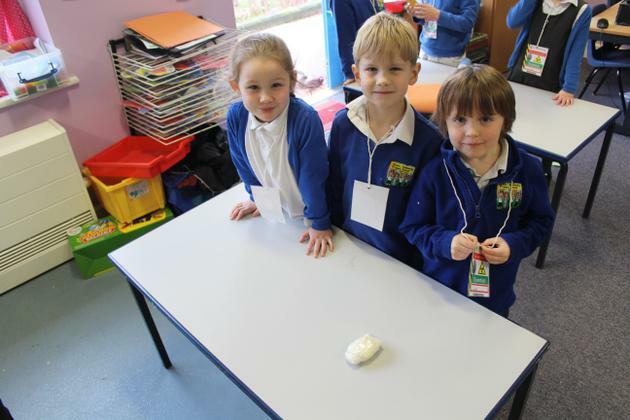 We then decided we needed to test materials to see which would be best to keep him safe from water. 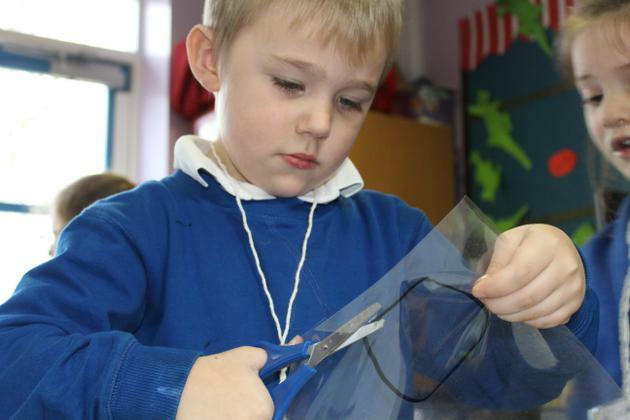 We designed our own items to keep him safe from the rain. we found that a plastic coat worked best. 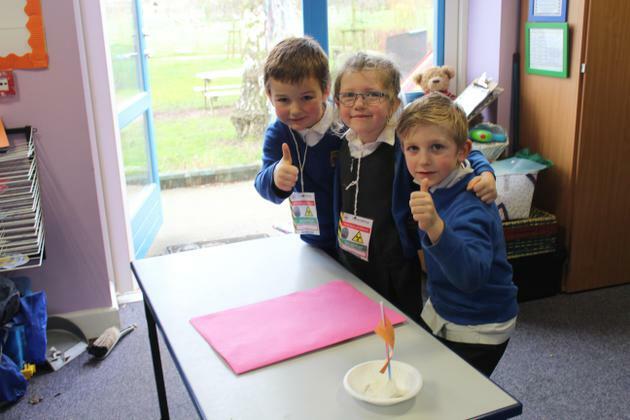 Lastly we needed to design and build a boat to help the gingerbread man across the river. 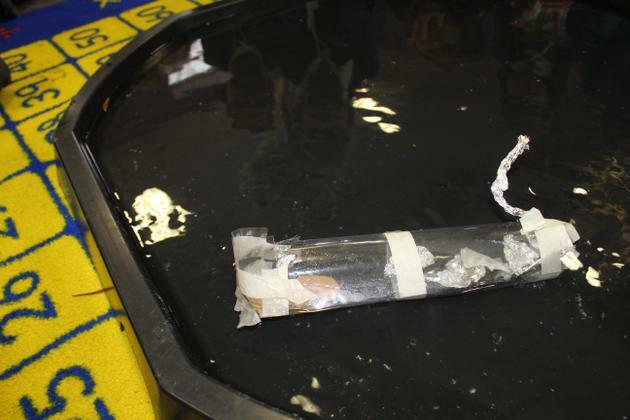 Our winning boat was made from a paper bowl, a plastic straw mast, and a plastic sail or a paper sail as these boats got across the river in 6 seconds. Our slowest boat was heavy and took 27 seconds to cross the river. 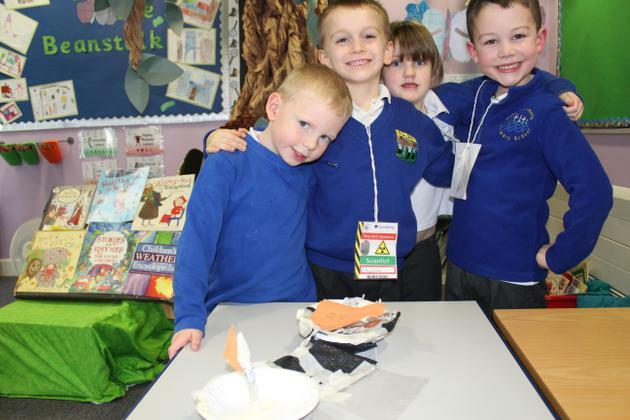 We also had a boat that sank! We recommend that the gingerbread man should try to avoid any open water as it could hurt him but if he needs to he should wear a plastic coat whilst riding on a lightweight boat. We have had a fantastic day! 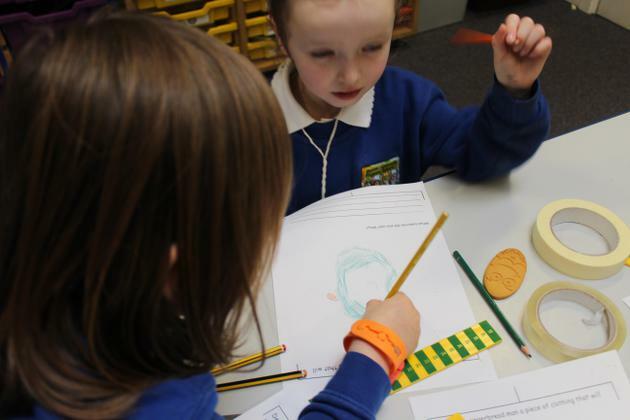 This week we have been working hard to understand the different values of each coin that we use. 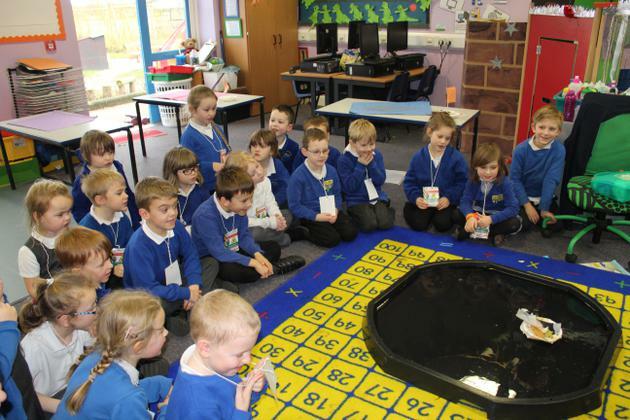 We began by swapping different amounts of 1p coins to make single amount coins such as 2p, 5p, 20p, 50p and £1 coins. 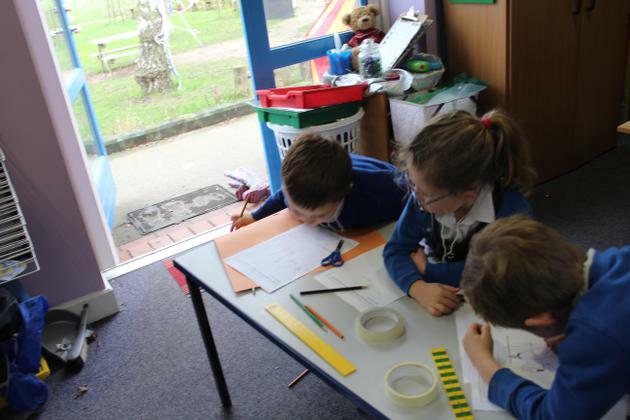 We then investigated and learnt about ways of making the same total in different ways. 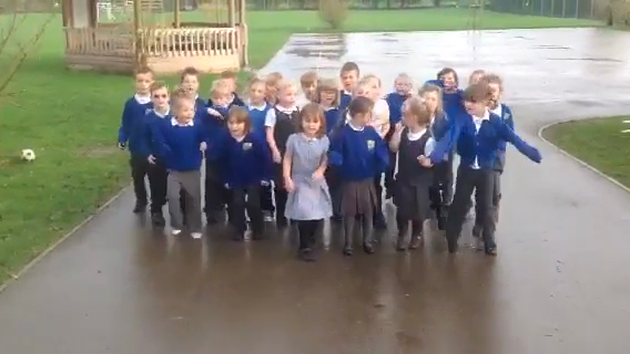 This week we were greeted by a special surprise! 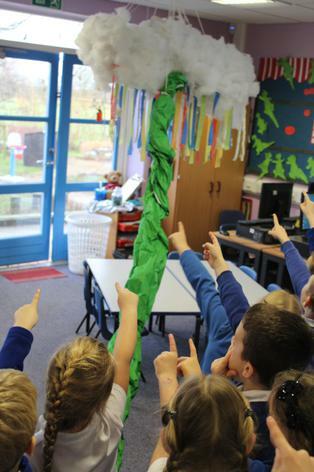 As we walked into the classroom on Tuesday we were greeted by an enormous beanstalk. We have been asking questions to find out who planted the beanstalk ad we discovered it was Jack! So we are going to learn all about his story. so far we have been asking questions and writing sentences about what has happened. This week was a busy one! We walked to the church three times! 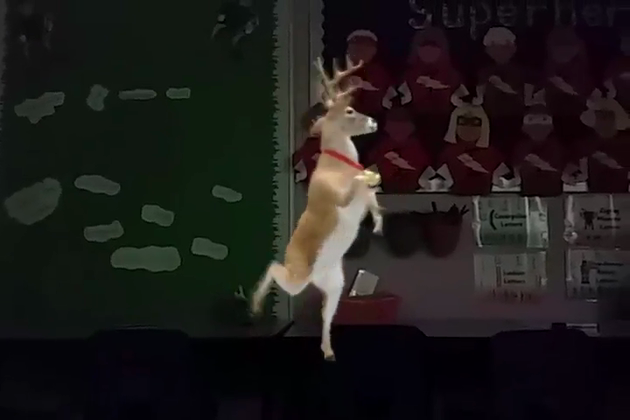 It was all for our nativity production. 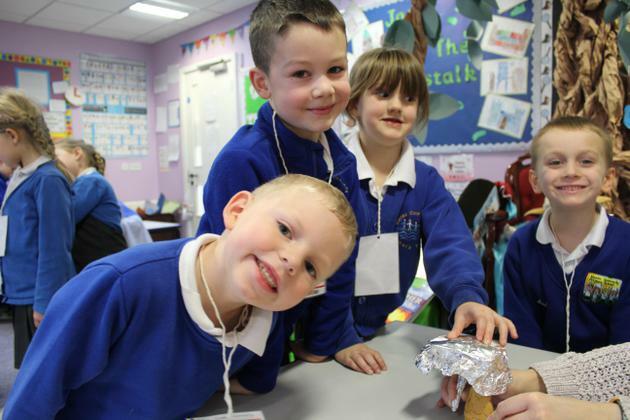 Make sure to look at the schools news for some pictures of the wonderful event. Below are some quotes from the children!
" 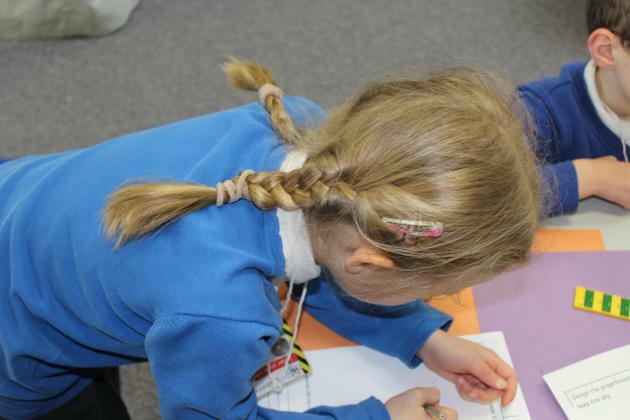 I liked it when I needed to walk around the church"
"I liked saying my words"
"I thought it went well"
"I liked being on the step"
This week we have been looking at poems with repeated language and rhyming words. Look below for one of the poems that we have learnt. This week we have also been incredibly lucky to have one of Santa's elves come to visit us! On Tuesday he use a zip line to enter our classroom and he left us a diary each. 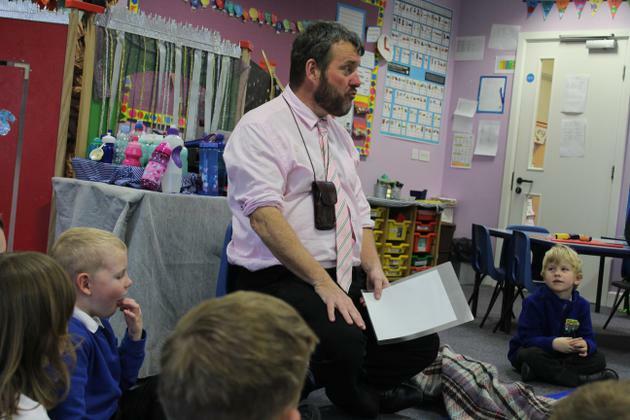 On Wednesday we found him in the outdoor classroom reading a room after following some glitter that he had left on the ground. On Thursday we came in to find Leon the elf stuck in our shape box and he had left us a challenge. On Friday we came into the classroom and saw him hanging on the whiteboard with a note to say someone else had visited over night. See below to find out exactly who came! 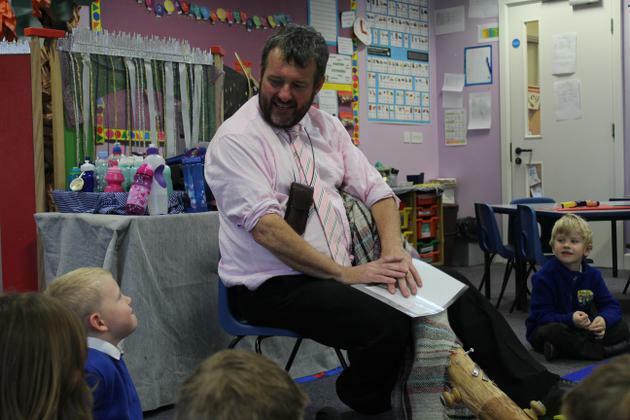 This week we were really lucky and were able to take part in a story telling session. 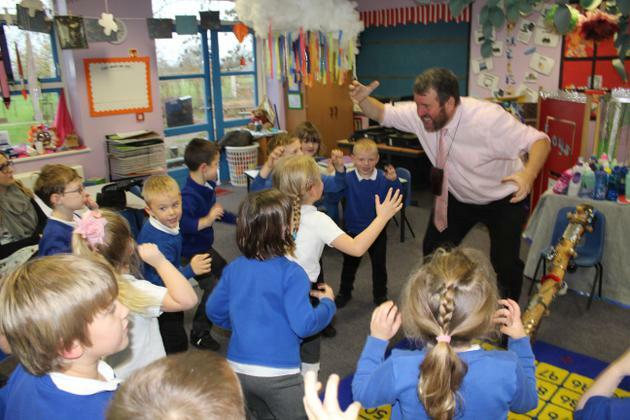 Peter told us a story and encouraged us all to act out the actions of the ogre. 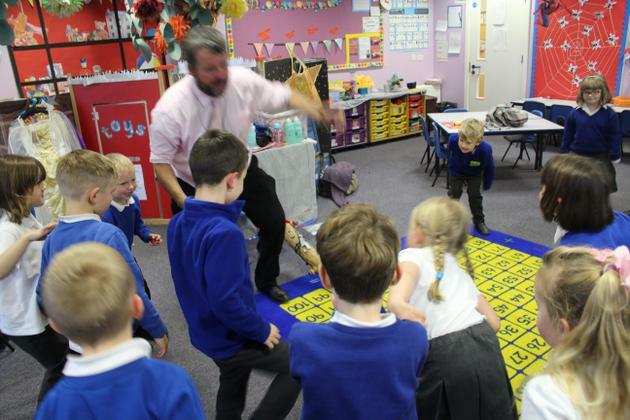 We also got to play on a special musical instrument.We had lots of fun and we really enjoyed it! WOW! What a week! This week we have been following instructions and learning all about imperative verbs. We baked some bread and identified the imperative verb within the instruction. 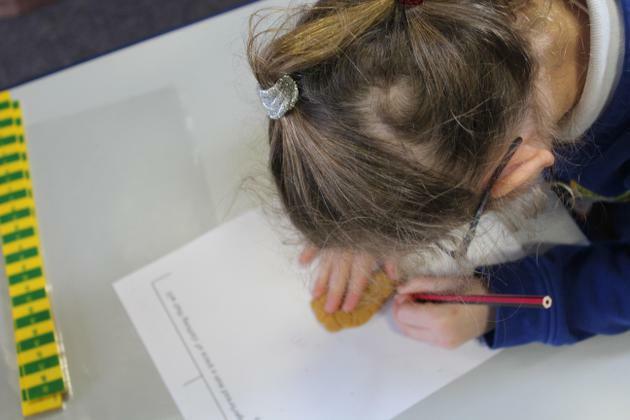 On Friday we had a forest school session with year 4 and we also teamed up with our forest buddy to write a recount about our time in the woods. This week we have been learning about the festival of Diwali and how we prepare and celebrate special occasions in our life. We learnt that people decorate their houses with Rangoli patterns so we decided to make our own! I hope you all had a lovely break and it sounds like you all had a lot of fun! This week in class we have been very lucky to be involved in some great things. Before the break Year 5 were challenged to create a trail for us to follow and on Monday afternoon we followed the trail and carried out the challenging activities. Later on, during the week we had an excellent lesson on odd and even numbers where we had to build, draw, say and write what we knew. This week we have been looking at British Values. We have identified that we are all the same although some of us come from different places within England or further afield. As part of our work we created a shield. We had to think of things that made us who we are and things that we are proud of. Have a look at the pictures below for some examples of our shields. Half term homework- Our homework for this holiday is to find out about the toys that the people around us grew up with. It is completely up to you how this information is displayed. 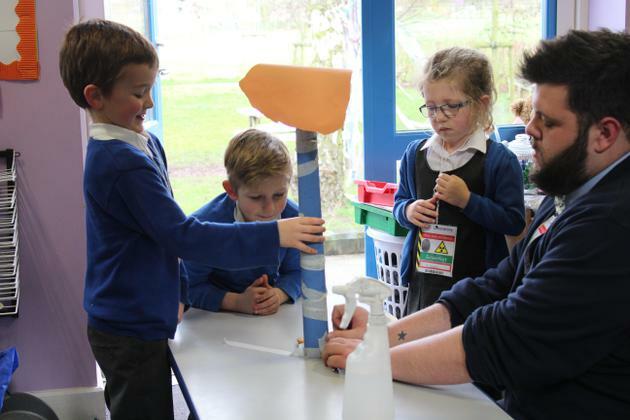 it could be notes on a conversation you have had, a poster displaying some pictures of old toys or even have a go at making your own old fashioned toy! This week we had our first experience working with the laptop computers! We typed up our Traction Man adventure and used our rock star fingers to unlock the laptops. We have also spent the week preparing for our Harvest assembly, we hope you enjoyed looking at our work! Finally we had our very first buddy reading session with Fir class! 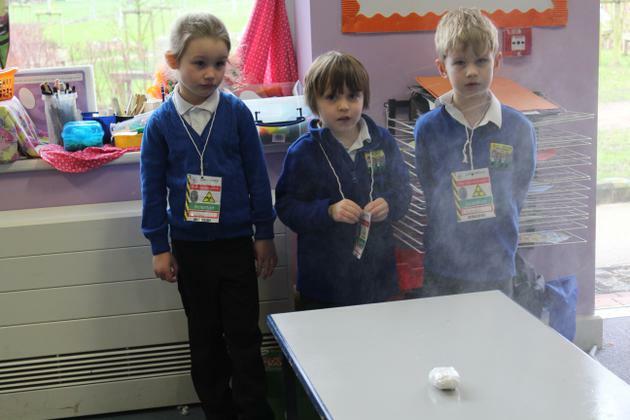 Look at the pictures below to see what we got up to. 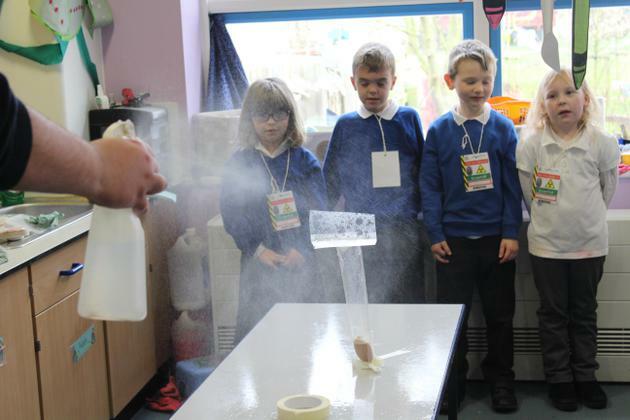 This week we have been scientists! 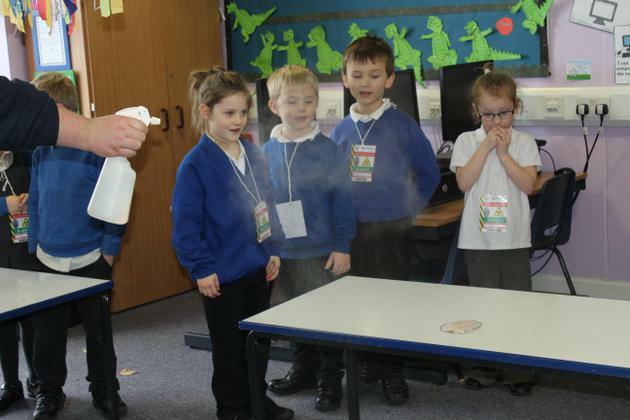 We have explored the ways our senses help us and understand why they are so important to us. We looked even closer at our sense of taste and explores how our tongue works. 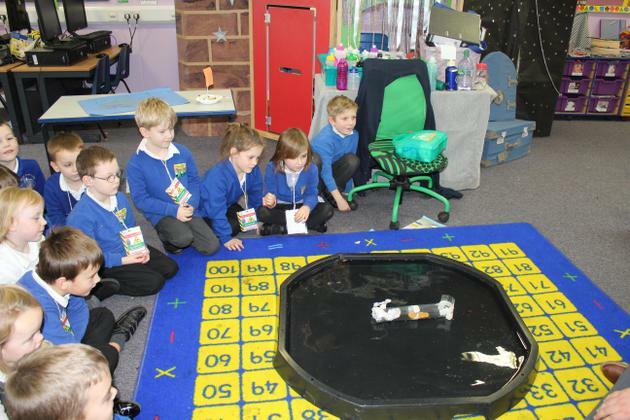 Traction Man Saves Elm Class' Toys! This week we have been looking at planning our own Traction Man story. We used Strip designer to create a comic book style story plan. We took a picture for the beginning, middle and end, ready for us to use when we come to write our story! 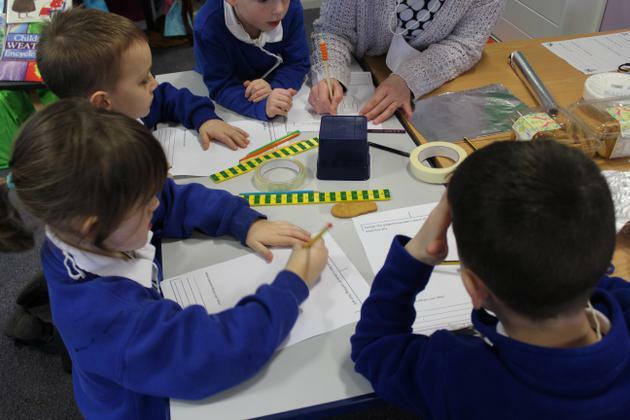 In maths this week we have been looking at measurement. 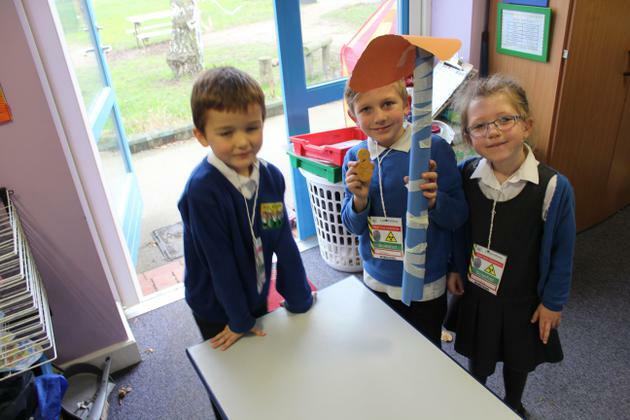 Some of us went for hunt around the school looking for things that are bigger, the same as or smaller than a meter long. We have also been working hard on creating our masks for D+T it has been messy but extremely fun! We were even lucky enough to have Ms Boardman in to help us. This week we have begun exploring the story of Traction Man. We have been writing some fabulous speech bubbles and making predictions about what might happen next as we move through the story.Have a look at some of the predictions that were made below. As part of our exploration of British Values Elm class had a taste of democracy and the rule of law. During our first week we created a list of things that we think make a great learner. 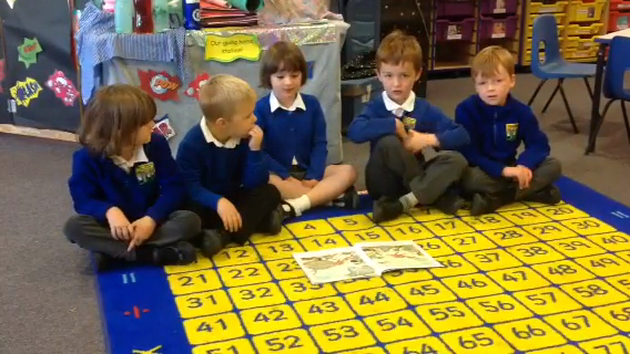 This week we reviewed who was the best learner and we all voted for who we thought. After the voting took place we came up with a few sentences about our winner. Look back in the future to read some more clues! 'He has been the best learner in our class. He always tries new things. He always uses kind hands. 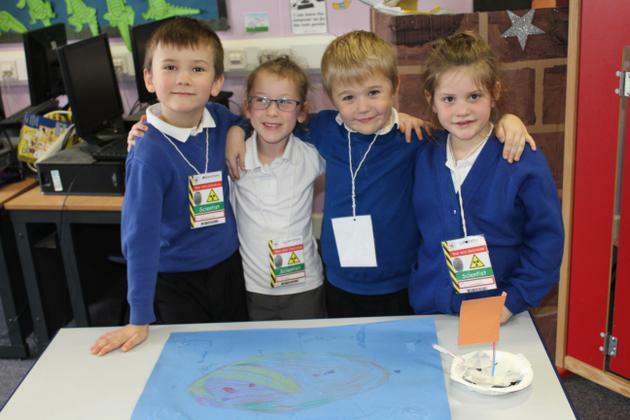 We have also been helping Ms Boardman to create a British Values Display. We decided to make a carnival mask to celebrate the Notting Hill Carnival. Look back soon to be able to see a picture of our creation. It has been a lovely summer and all of Elm class came in ready to learn! Today we got used to our new classroom and even stepped inside a superheros photo booth! some of the pictures are below! We are going to put them inside of our very own superhero den. We have also enjoyed labeling a superhero and building den pictures using Numicon and counting how many windows they have. We are really looking forward to the rest of the year! 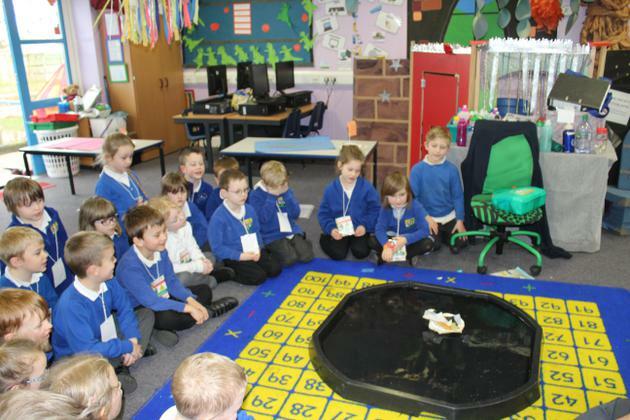 Our first day in Elm class!